Last weekend I again hiked up Jian Feng Shan, this time with several others from the university. It was a bit hazy/cloudy, but the view was still quite good. 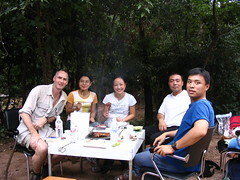 Afterwards we had a BBQ lunch. Yum! yes it is beautiful and to conquer it is really commendable.the man on the left is Andrew isn't he?I 'd like to see more pics if possible.wish you have a happy time here in china. Joy, you can see more pictures of the hike if you click on the picture above. Whist, briefly: nope, nope, yes, yes, say what? A more in depth review of life here is forthcoming. Hmmm . . . I count but 5 responses to 6 Qs. Huh'm'huh? Hao bu hao, ni? There's a cool firefox ext. called ChinesePera-kun; lets u get translation by hilighting Chinese. I've been: reading about the Spring and Autumn Period, designing probabilities for grammar rules, eating Oreos, petting Sam (who is a cat), thinking 'cells are people too'. Whist, that 'cells are people too' thought is a dangerous one. I don't recommend it. Recursive personhood is a serious memory hog. The yue-bing was too good. I've been sick this week, but otherwise bucuo. too many adventures to write about. I've been using the BBDict extension, which is supposed to do the same thing, but it's been working sporadically. I'll try the Pera-kun one. Oh, and thesis is on hold until next semester. That's what dna is for. I wonder whose dna I am. Sick? Fevery and p**p? Did you eat rice gruel? It's surprisingly good when you're feeling sick. Adventure-wise, a) you should be keeping a written journal, and b) you might think about getting a mountain bike - they're cheapish and they give you great freedom. How's the teaching? How come no English Coroner? I know all of them, just not u then. I'm leaving this town soon, Andy lives in Hangzhou, Wei went to chengdu, Kim now lives in australia, you r in SD. 10 yrs later, where shall we go for a reunion?